If they find out about the error, they might take away her Blipper. That could be good for you…. 95.9% of the time Mrs Sensible is correct so it is always good fun when she makes a mistake. I might throw an extra packet in when she blips them next time, just so she is back to square one. And I agree, the blipper is a nuisance, if they take it away from her I can go back to slipping bottles of limoncello and chocolate in the trolley. I’m going to be very French about this. I would say that there are many more occasions on which the supermarket gets it wrong, in their favour, and they don’t check their figures OR lose any sleep over it. The last time I checked my receipt (just before Halloween) I discovered that my mini pumpkin for my soup had tripled in value because the check out girl’s muttering as she checked on her list covered the invoicing of a Jack O’Lantern from the toy department. Of course, I had already cooked the evidence by then. So it was Karma biting me on the bum for buying veg from the supermarket – never again. Tell Mrs Sensible that your free packet of biscuits is just returns for my loss. It is obviously weighing on her consciousness and I am trying not to mention it too much, well OK maybe just a couple of times a day. And the biscuits are also weighing on my waist line. To get fit and loose weight I have restarted karate after many many many years. Some days I can actually walk rather than shuffle or limp. Bad PN. I like Mrs Sensible. Mrs Playmo will be over to explain what she should do with her bad conscience – sounds like Jiminy Cricket has moved in – lock, stock and barrel. Last time Mrs Playmo was here she was worse than me!! Please let me restock my wine before you send her over. consider the extra packet a gift from the universe, eat it, enjoy it, and move on. everything balances out in the end. I am amazed that Italy is at the forefront of technology with these blippers. I think it is a conspiracy to prevent husbands from buying important things like wine and chocolate. how cool is this…we don’t have these little nifty devices where I live…yet—but how cool is that…however I figure it is because there would be many items placed in shopping buggies, aka trollies, that the “innocent” shopper absentmindedly “forget” to “blip”—leaving lots of items off the final receipt…. The have a woman that stands near the machine where you pay and her job is to do spot checks on guilty or suspicious looking shoppers.. Of course Mrs S didn’t look guilty because it was a mistake. 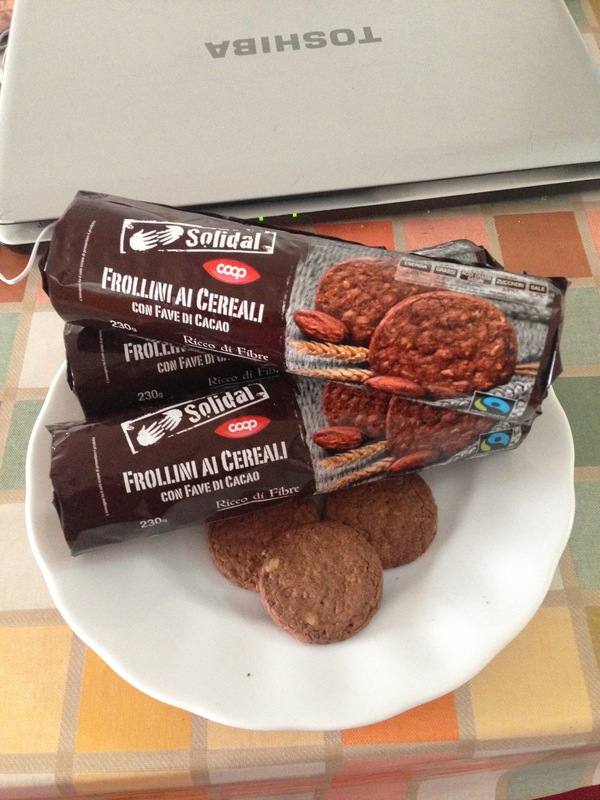 These biscuits are cereal biscuits, not bad but not as good as chocolate digestives or Jacobs club biscuits or even…. PS MrS has just phoned to say she is on her way to Ipercoop to buy supplies and one packet of biscuits but she will blip it twice. What if you volunteered to carry the clipper and push the cart? 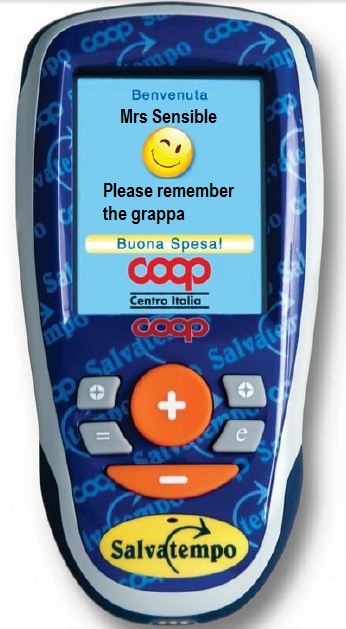 Then you could accidentally blip some grappa and load it into the cart to materialize mysteriously at home. Of course it requires some effort…. It appears I am not responsible or sensible enough to be let loose with it. You need a long term strategy. Build up some trust. Make puppy dog eyes as you pass the grappa and let out audible sighs? Been there, done that, doesn’t work. Your blog always has me smiling out loud! Poor Mrs S, she must be suffering the pangs of remorse and guilt while you brush cookie crumbs off your chin. I can’t imagine Italy being at this forefront, either! No sign of the blooming, blinking blippers here in Venice, anyhow. As I type, Mrs S is stood paying for two packs of biscuits but will return home with only one, (I know this because I just phoned her) thereby eliminating her original error. This is good news, Mrs S will be happy and I will have yet another packet of biscuits. So all in all it is turning out to be a good week. Wow. Ms. Sensible takes honesty to a whole new level. Bravo. Me? Like you I would just eat the evidence. She went yesterday and fetched another packet so that she could pay for two. 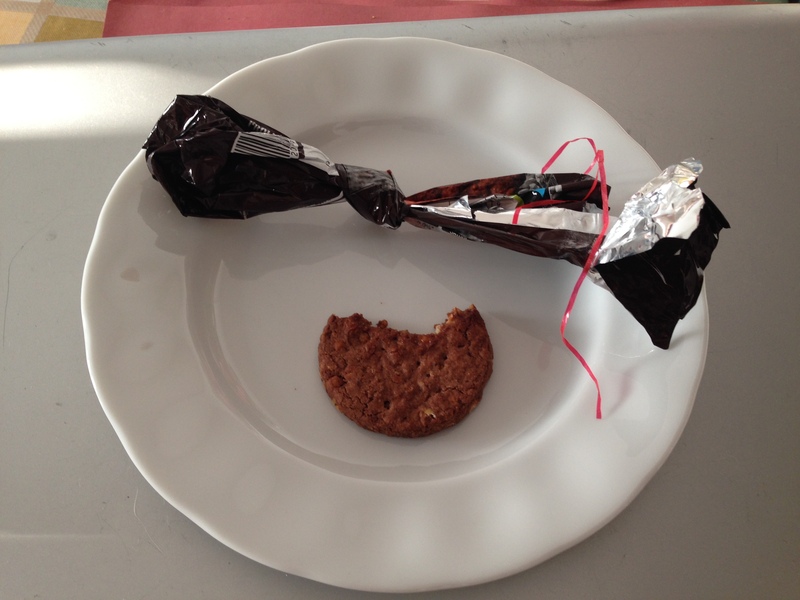 There is a burning question not addressed in your post … why was Mrs Sensible buying biscuits in the first place?? Lol, Elaine no one else noticed that… I think I had been good that week either that or she failed to catch me being… well me! Actually I had that thought when I saw them but thought….well, maybe she gave up on the diet. I only have one packet left.. I am not sure she will take me again. There are no blippers where I shop at my local HEB grocery. 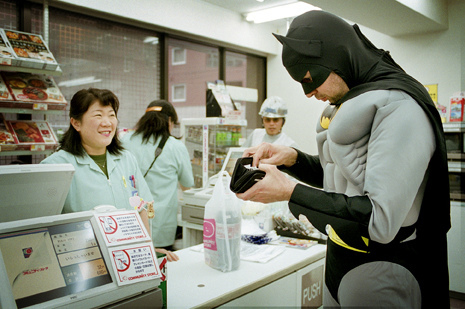 Each item is scanned by the checker at the check out aisle. But this was a good pay back for you since you have to push the trolley/cart around. I detest grocery shopping. It’s a lot of work. Those biscuits/cookies looked delicious. They were delicious. Did you notice the use of the past tense?